The first few laps were really fast with splits in the field and large groups rolling off the front. I made it into one of these splits with about 15 riders, but there wasn’t enough cohesion in the group to stay off the front. At this point, it’s hard to remember exactly how the final break materialized. I was riding aggressively on the points prime laps to try to get omnium points and managed to snag 3rd place on two of them good for 1 point each. On lap 16, I was already in a break of about 12 riders when I led out the sprint for the omnium points hoping to get a jump on the faster guys. I managed to hold on for third but the sprint itself had shelled a few riders. At this point we were down to 8 riders. About midway through the next lap, a group of three including Alexey Schmidt (Team Type I), Serghei Tvetcov (Aerocat), and Demis Aleman (Jamis) rolled off the front of our break. For the next three laps, the five of us that were left – me, Oscar Clark (Realcyclist), Shane Braley (Chemstar), a Mountain Khakis rider, and Team Cocos rider worked to chase back up to the three off the front. When we finally caught them, it was back to a break of 8, but one that lacked any cohesion at all as everyone was tired and everyone had strong riders in the field and chase behind us. I didn’t want to get caught so I kept trying to push the pace and would roll off the front either by myself or once with Alexey and once with Shane. The rest of the group would always get itself organized again and work its way back up to us. With 5 laps to go, they rang the bell for a points prime. Without any cohesion in the group, I rolled off the front again this time getting a pretty good lead. Realizing that there were three omnium points on the line, I drilled it hard to try to stay away for the points. I looked back and was shocked at the gap I had opened up. So that helped me to keep pushing harder hoping to have enough of a lead so that when the group started to chase I would be able to hold on for the points. About 3/4 of the way through the lap, I realized that I was going to get the points and that I had a big enough lead that there was a realistic chance I could win the race! I settled into as hard a rhythm as I could maintain and stayed away for the next three laps. I couldn’t even sustain 300 watts by this point in the race even with the extra motivation of a chance at winning an NRC race. So by the start of the last lap (2.6 miles from the finish), a group of 3 that had split off from the rest of the break caught up to me. At this point, I no longer had any thoughts of winning the race, and I was still concerned about the remnants of the break or even the 1st chase group from the field catching up to us by the end so I went to the front one more time to try to keep the pace up into the rolling section. There was an attack at the bottom of the climb, then a counter-attack by Serghei at the top that saw him get away solo. A couple seconds later, Demis attacked hard up the right-hand side with Oscar and I on the far left. He immediately got the gap and closed the distance to Serghei. Oscar and I were left behind to fight it out for 3rd. In the final sprint, I tried to go early attacking on the feedzone hill but Oscar was able to hold my wheel and come around to take third with me getting 4th. Ahead of us, Demis took the win just ahead of Serghei. Gene and the Swagger crew put on a great VIP tent with food/drinks for the riders, and the podium ceremony was in front of thousands of people gathered for an annual concert. With the 5 omnium points that I got during the race, plus the 14 points for finishing third, that was enough to move me up to 11th overall for the weekend. At the beginning of the weekend I was hoping for a top 20 in the omnium, so I was able to almost get a top 10. Great way to wrap up the NRC racing calendar. I’m excited for two more races to end the season – Pensacola in two weeks and then the Six Gap criterium and century the week after that. This entry was posted in Racing and tagged circuit race on September 5, 2011 by kartoone. First off, congratulations on your fourth-place finish. That sounds like some pretty serious competition. On another note, I successfully took on the Double Oak Way monster on Saturday morning at the end of riding the Routes 41 & 43 loop. Turns out that a cycling friend of mine was familiar with it. 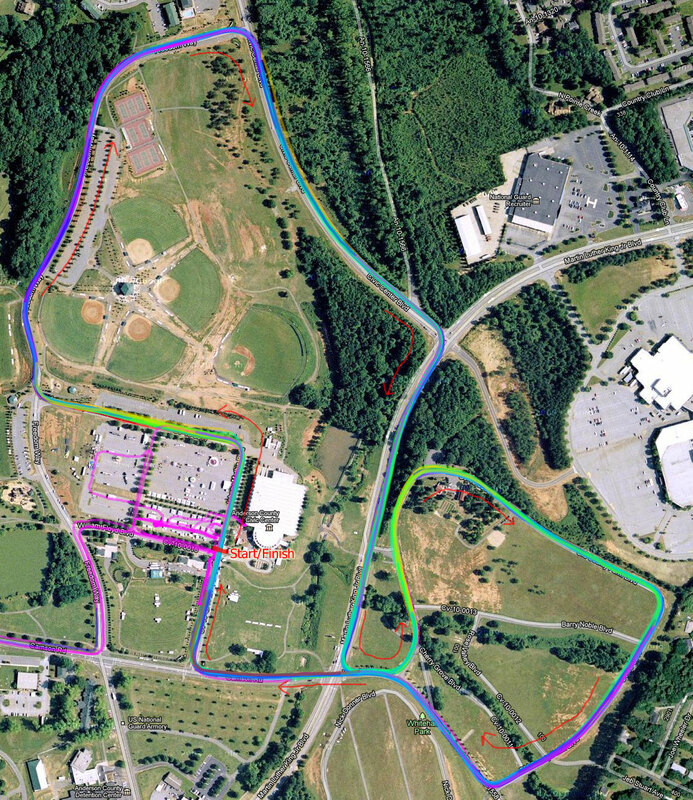 Regarding the .42 miles at 23.9% you noted re: Double Oak Way, is that from the beginning of the climb–the ascent beginning not too far off of Route 41–to the gate, which prevents unauthorized cars from proceeding further? According to my odometer, it was around .5 miles from the beginning of the ascent to the gate, and then about another .21 miles after the gate to the top of the crest of a very steep ascent. Still goes up a little after that, but it’s relatively mild, as you know. Thanks for any input you can provide, Brian. God bless you and your family. Hi Tom, the 0.42 mile figure is actually a sum of four different portions of the climb that have gradients of at least 17%. 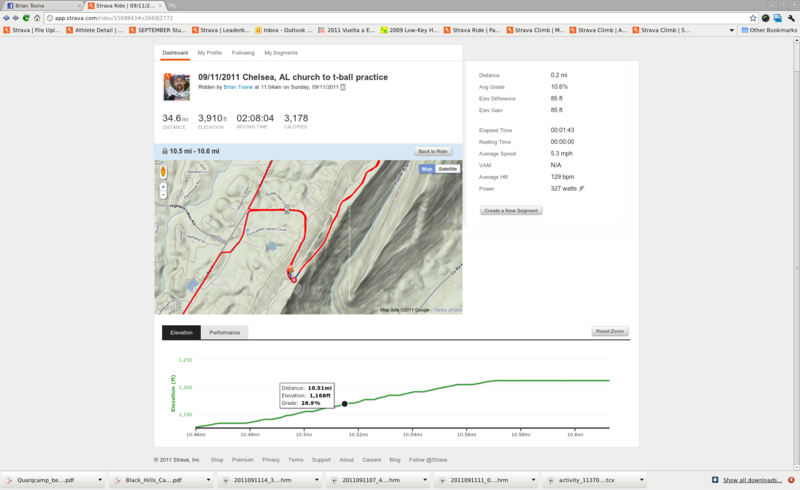 I call that the “Scanuppia Factor” for a climb based on a famous climb in Europe that averages 17% for nearly 5 miles!!! So I decided to rate the climbs in Birmingham based on the total length of all segments of the climb with a gradient greater than or equal to 17%. The “descent” from the towers also has a 20+% gradient, which means that you climb a 20% gradient on the “downhill” – gotta love that!!! 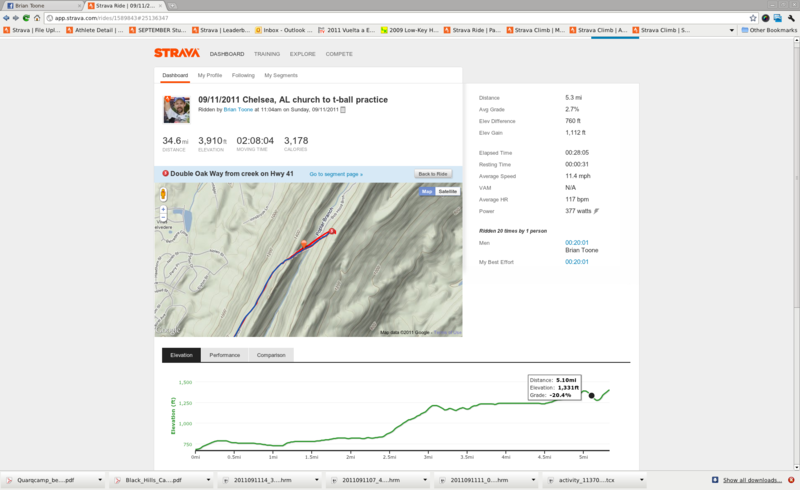 I took screenshots at about where the steepest points are on the Strava elevation profile. 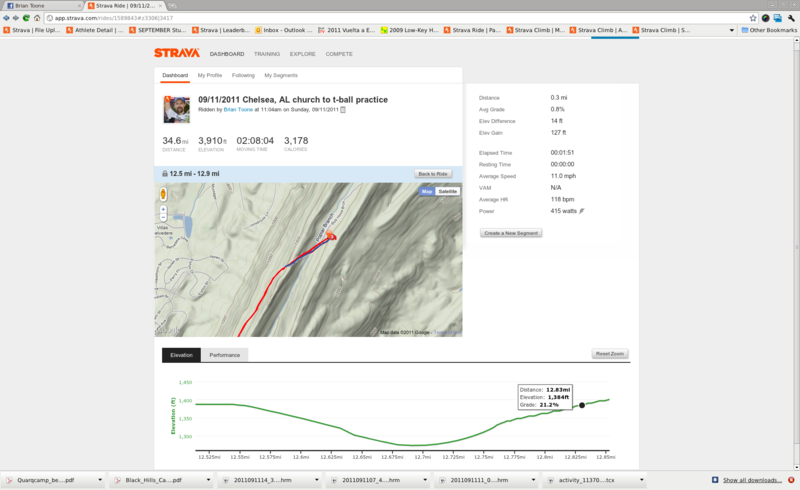 Strava uses my Garmin 800 elevation data to calculate gradient. The Garmin 800 has a 7 vertical foot threshold before recording a change in elevation so if you zoom in far enough you get this stair-stepping gradient with 0% portions and super steep portions. That is why the Strava screenshot shows 28.9% in the portion that should be closer to 24%. Either way, it’s crazy steep. very cool brian! been following you for a bit..i was 4th at the huntsville omnium a couple of months ago that you won and was amazed when i saw you at the top of strava on the kom contest for july. planning to do the pensacola stage race in a couple weeks as well. i’ll try & say ‘hi’. Thanks Marvyn – I’m really looking forward to the Pensacola race – would be great to see you there!